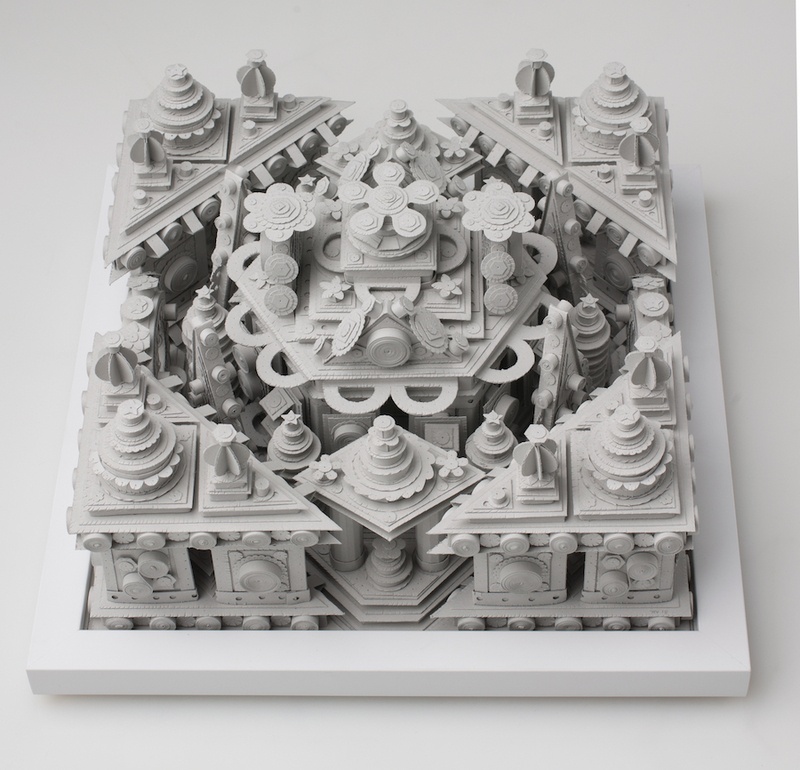 Liz Miller: Your paper sculptures are ornate and involve elaborate ornamentation—not unlike the many layers of ornament one sees in great cathedrals, the seemingly infinite patterning in Moorish architecture, or--and I think this is a more direct influence--mandalas. Your work is influenced by spirituality/religion, and you have studied Theravada Buddhism as well as the Vedic philosophy of Advaita or Non Dualism. Can you elaborate on the relationship between the forms and/or process of making your work and the spiritual or religious connection? Does the slow process of making these works by hand relate on some level to spiritual practices? Michael Velliquette: About five years ago I started studying with a Theravada Buddhist teacher and practicing Vipassana meditation. In the first few months of my sitting practice I began to become more aware of ways I operated in the world that weren’t serving my baseline happiness. Some aspects of this related to my studio practice. I started to see that as a working artist I often attached greater importance to what my work could help me attain in terms of bolstering my ego. Getting some distance from that state of mind helped me to revivify a nurturing attitude towards my work—what I could do to support it, rather than focusing on what it could do to support me. It was out of that space that the new paper sculptures manifested. They relate to the meditation practice in the sense that making these requires I work more slowly and intentionally than I had previously. I can’t “tune out”. Since they evolve from one cut shape to the next and I don’t work from sketches I have to be more consciously present while making them. Another corollary has to do with the notion of skill. Buddhists use the word “skillful” to describe habits and actions that support more kind, compassionate and equanimous states of being. In terms of material handling and tool dexterity these are the most highly crafted works I have ever made and reflect an effort on my part to generate similar states through abstraction. And yes, there are established precedents for the merging of spirit and form, in fact I believe it’s one of our earliest means of creative expression as a species. So, all of the references you cited are in my spheres of influence. In this body of work, I’ve also embraced the Modernist axiom about “truth to materials”. Paper has been integral to my practice for almost twenty years and this work marks a renewal in my commitment to the medium. Liz Miller: The statement on your website very eloquently describes the evolution of your work over the past fifteen years. One part that resonated with me is the portion where you discuss a transition from image-based works to works that are more ambiguous or multi-faceted in their references. You state, “Over time, my work has become less tied to pictorial schemas and less concerned with representation than with documentation of process. My approach has become more improvisational: instead of relying on drawn studies, I simply allow works to accrue cut-by-cut and piece-by-piece. “ I am currently going through a similar transition—it is simultaneously liberating and frightening. While I feel like the work is more conceptually layered and richer than ever, sometimes viewers struggle without being able to easily pinpoint a reference. What has this transition been like for you? 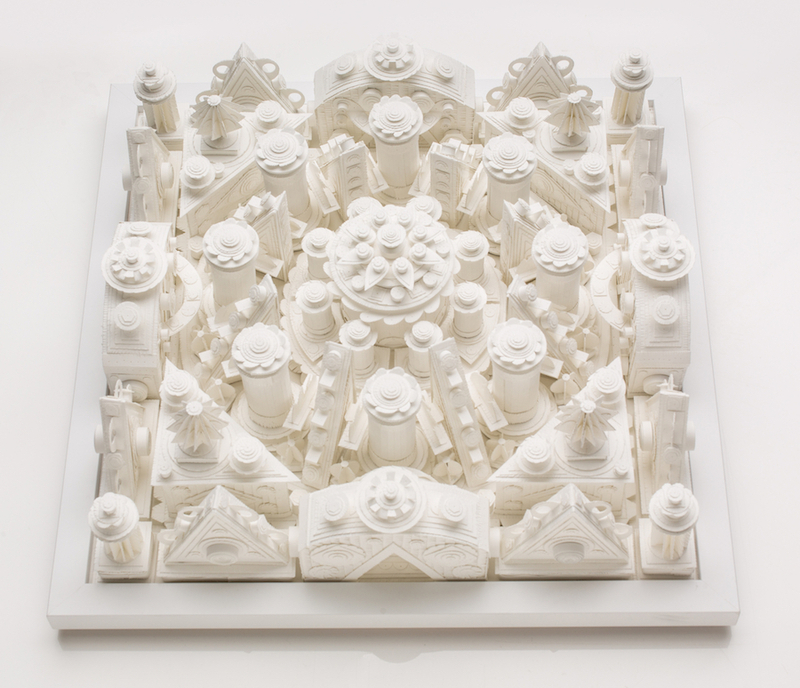 Michael Velliquette: For me the transition towards more non-objective work occurred with a shift in my process. When I start one of the new pieces, I don’t plan them. I start by cutting out basic shapes and arranging them in concentric layers. I see what I’ve made in a single session and then determine if I want to continue or scrap it and start over. In subsequent sessions I make more components that respond to what I’ve made previously. Individual forms accrue this way until they feel like a sufficiently finished piece to me, which can take anywhere from six weeks to six months. It’s a more repetitive way of working for me but it never feels monotonous. There is a lot of slow-motion improvisation and I invent new techniques all the time. Despite how long they take to make I can never anticipate how they will ultimately look. It’s always a surprise seeing what they look like when they’re finished. I would also say that I haven’t totally abandoned representation. In fact, I’m starting some image-based work this spring that takes a new look at some of my familiar themes around the notion of self and non-self. I’m curious to apply what I’ve learned from the formal sculpture to making people and things. 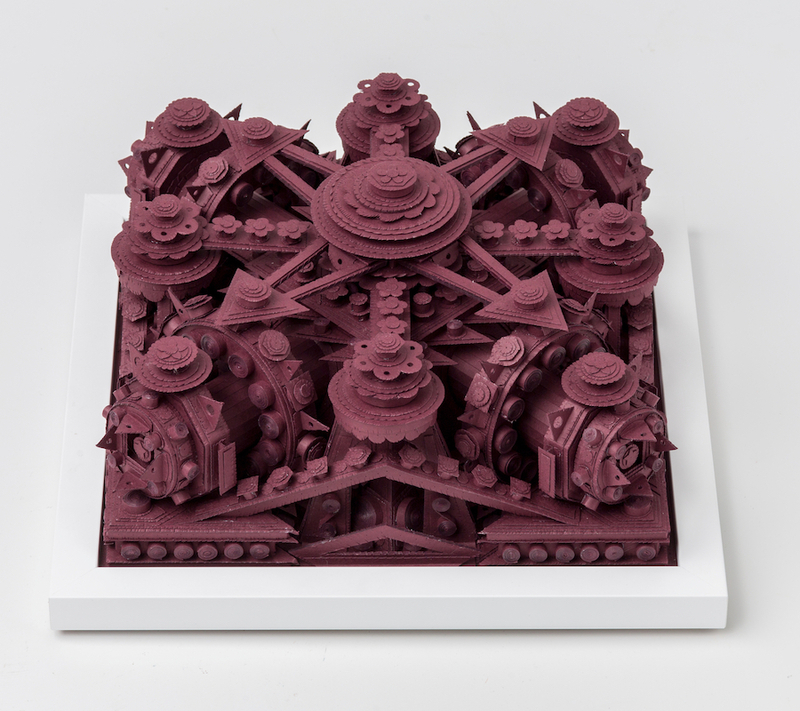 Liz Miller: Your work has ranged greatly in scale, ranging from giant site-specific installations to your more recent endeavors, which are still dazzling in craft and complexity, but are of a miniature scale in comparison to some of your earlier works. Talk about this scale shift, and how you see the relationship between these bodies of work. Michael Velliquette: I’ve always been sensitive to the relationship of scale, form and space. When I think about it, going back to my childhood I took a keen interest in decorated environments. I made what I consider my first successful art installations in the early nineties while I was an undergrad at Florida State. In terms of my studio production over the years I’ve moved somewhat seamlessly from large scale immersive spaces to more intimately sized works without giving it much thought. As my career developed and I started doing more and more shows I found myself thinking less skillfully about how scale served the work and instead focused more on the amount of work I thought necessary to fill a show. That’s changed with the paper sculptures. I began them during a period when I didn’t have anything coming up show-wise. It happened around the same time my New York gallery—DCKT Contemporary—closed. I remember feeling unmoored in the studio. But little by little a sense of spaciousness set in. Over subsequent months I made work without anyone looking and without any intention to ever show it. I was deliberate. I questioned every element. This allowed me to think about scale again as something generated from within the work’s own instincts. So, right now it’s true that I happen to be making things that are relatively small, but I know when I start to make larger work again it will be informed by this new skillset. Liz Miller: Speaking of scale shifts: It would be hard to interview you, or talk about scale, without talking about Lovey Town, the curatorial project that invites artists to create works at a miniature scale (I first met you when you invited me to take part in a Lovey Town exhibition). Through this project, you painstakingly place curated miniature works in exhibitions…complete with opening receptions, catalogues, etc. Artists can attend an opening reception for a Lovey Town event and see a diorama of themselves attending the event in small-scale. It’s very meta. How did you arrive at this idea, and how has Lovey Town influenced other parts of your practice? Michael Velliquette: I have a history with artist-run projects. Years ago, in San Antonio I ran a brick and mortar exhibition space with the artists Joey Fauerso and Leslee Fraser. When I moved to Madison, I had always intended to open another space, but for the first few years I found it was challenging enough to keep my own career afloat. When I finally came up with the idea for Lovey Town my goal was to be a more active citizen in my art community. Over the past six years I’ve mounted about twelve exhibitions and have worked with more than one hundred artists. At first the decision to make it a miniature space was simply about ease, but I quickly learned that’s also what draws people to it. Lovey Town hasn’t influenced my studio work formally, but I think it has informed the way I think about the role of artists as generators of positive experiences. Liz Miller: While your new work is as intricate as ever, the color palette is a huge shift—your previous works were an explosion of bold color, and the newer works are quite muted and nearly monochrome. There is a unifying element to the limited palette, and also an almost somber effect. What was the catalyst for this transition? What are the conceptual implications of the pared down palette? Michael Velliquette: A few years back I took a break from the colorful paper-based work while I had some larger site-specific projects going on. When I came back to the paper work, I found that my color sensibility had gone dormant. The color studies I made felt…forced. As the work became more sculptural, I realized that too much color was visually burdensome to them. The sculptures are more form-focused and the muted, monochrome palette is more supportive of the kind of contemplative experience I want people to have with them. Michael Velliquette: I’m planning work for my next solo show scheduled in spring of 2020 at the David Shelton Gallery in Houston. In the short term I have a piece in a show that opens this month at the Society of Arts + Crafts in Boston, and I’ll have a few things in the Cinders Gallery booth at the upcoming Art on Paper Fair in New York in March. Michael Velliquette: These days I’m spending lots of time in the yoga studio practicing handstand! 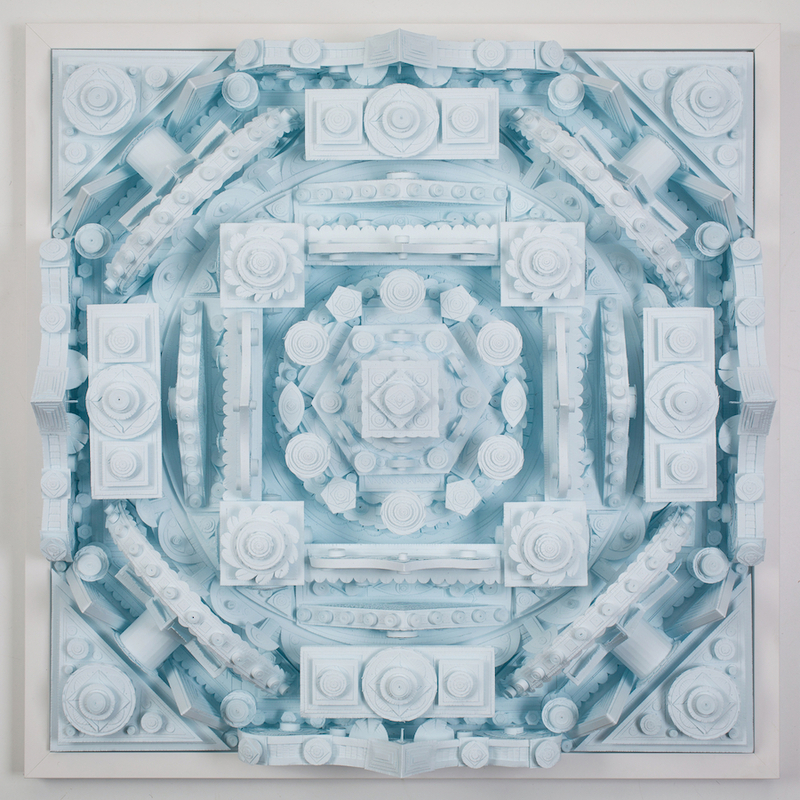 MICHAEL VELLIQUETTE is a paper sculptor whose intricate works combine exuberant abundance with an inventive formalism. A working artist for 20 years, Velliquette has participated in over 150 exhibitions in museums and galleries in the US, Europe and Asia. His work is in the permanent collections of the Chazen Museum of Art; the Art Museum of South Texas; the Racine Art Museum; The Progressive Corporation; The John Michael Kohler Art Center; and The Microsoft Collection. Velliquette is a Faculty Associate at the University of Wisconsin-Madison. He lectures and teaches extensively on his work and on the paper arts. 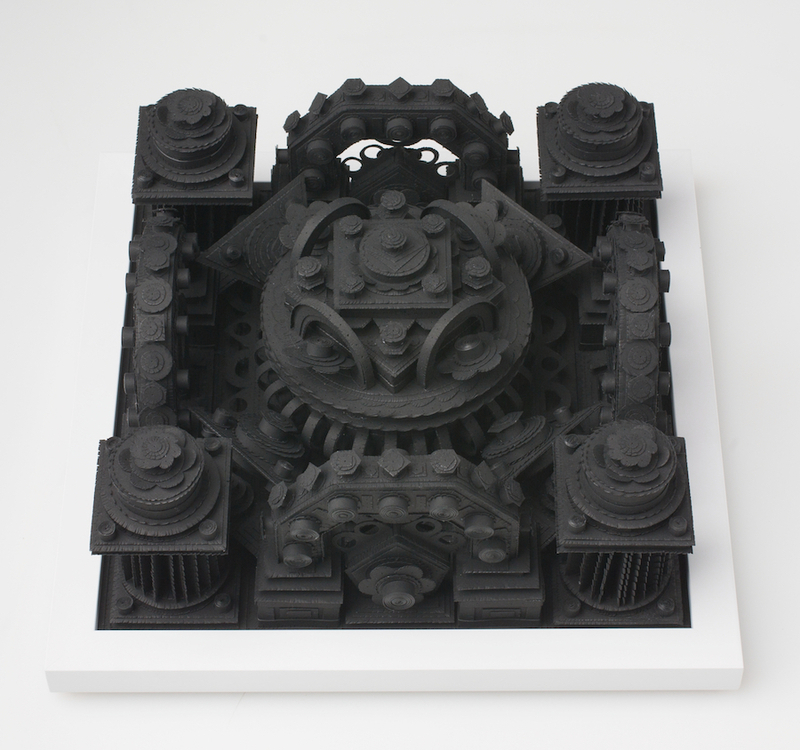 He was a member of the Guild of American Papercutters, and is currently in the Paper Artist Collective—a global community of artists and designers dedicated to the medium of paper. He has participated in residencies and cultural exchange programs including the Artpace International Artist-in-Residence; the SIM Residency, Reykjavik; the John Michael Kohler Art/Industry program; and EUARCA, Kassel, Germany. He received his BFA from the Florida State University ('93), and his MFA from the University of Wisconsin-Madison ('00).